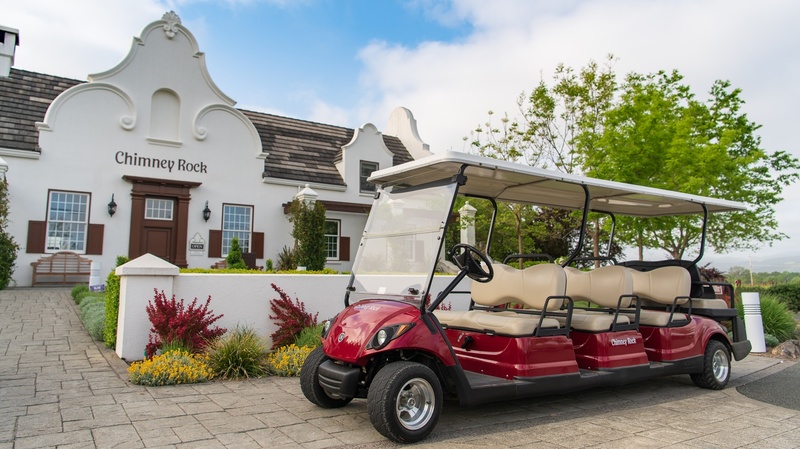 Journey out of the winery and into the vineyards in a specially designed touring cart for an unforgettable exploration of our Stags Leap District estate. Enjoy an exclusive, guided excursion and wine tasting in the vineyard, with our estate’s sweeping, dramatic views from the Palisades serving as your backdrop. Chimney Rock history, viticulture, and winemaking come together with commentary; stop along the way to enjoy gourmet cheeses and photo opportunities. Indulge in our unique terroir experience as you sample two of our iconic Cabernet Sauvignon wines in the very vineyards they are grown. Limited to 7 participants per tour. 24 hour advance reservation requried. Weather permitting. Prices are tax inclusive. "It was really neat to be out in the vineyard and experience the development of the product that ends up in the bottle. I have been on several tours at wineries and none make you feel as connected to the product. Gorgeous views of the valley were an added bonus!"